It’s been a year since a meteor collided with the moon, catastrophically altering the earth’s climate. For Miranda Evans, life as she knew it no longer exists. Her friends and neighbors are dead, the landscape is frozen, and food is increasingly scarce. The struggle to survive intensifies when Miranda’s father and stepmother arrive with a baby and three strangers in tow. One of the newcomers is Alex Morales, and as Miranda’s complicated feelings for him turn to love, his plans for his future thwart their relationship. 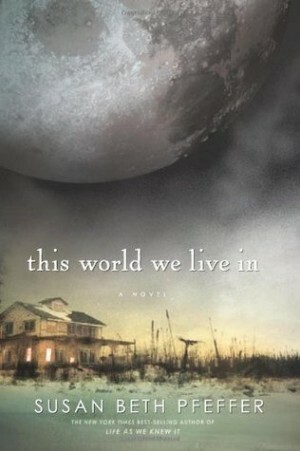 Then a devastating tornado hits the town of Howell, and Miranda makes a decision that will change their lives forever. I have a love/hate relationship with this series. I loved the first one, hated the second one and didn't like this one much either. I was so excited to read this book because I knew Miranda and Alex meet up and it's about both of them. I just didn't like the decisions that the characters made in this book and the way some things were handled. It's a year after the moon got closer to earth. A year since the world changed forever for Miranda Evans and Alex Morales. Miranda and her little family are still living in their house in their small town. Most everyone else in town is dead or dying but the Evans family is holding strong. When their Dad and his wife, new baby and three strangers show up their life changes even more. Now instead of 4 mouths to feed, they have 9. Everyone has some tough choices to make and no one knows what the right move is. I guess I'll start with the things I didn't like. I didn't like how Matt brought Syl home and then changed. In book one he was a strong character but in this one, he was just annoying. Plus he got mad at Miranda for falling for Alex when he fell for Syl much faster. Speaking of Miranda and Alex, I didn't feel their "love". That was lust, not love. Jon and Julie seemed to like each other more that Miranda and Alex did. I think every single character (except Jon and Julie) pissed me off at least once in this book. Especially with how childish Miranda was at times, a year starving should have made her buck up. I understand Miranda writes down everything that happens in her diary and that's how this book is made. But I would not have written about what happened to Julie like that. What if someone picks up her diary one day? What if Alex read it one day? I thought that was stupid and I thought that was unnecessary. I'm really not sure what I liked about this book and that saddens me because I started off really liking this series. In fact, it was one of my favorite dystopian series but it just keeps getting worse. There's one more book to read and if I had not already bought it I wouldn't read it.